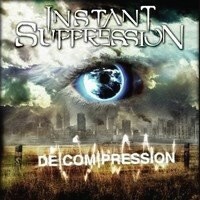 Instant Suppression is a young band from Russia. They started in 2005 and this is their 3rd release. Their demo EPs and this single are available as a free download at their website. The foursome kicks off with spheric sounds and some spoken words, but then head into a heavy progressive part. The music can be described as progressive power metal, but the growls they add give it a death metal edge. But they aren't just using growls! Keyboarder Kate adds some clean vocals and is joined by male clean vocals for the refrain - and they will hook you up! De[com[pression is more a powerful prog metal tune then melodic death metal, even if I saw that they are labeled as melodic death metal band. During the refrain the vocals - as well as the keyboard - give the track a slight gothic touch. This is only a 1-track e-single, but its quite interesting and I think I will check out their previous work... So far I can say that the Russians present an interesting mixture and I think that they can easily keep up with signed bands and would find a broad audience, if they get the chance!